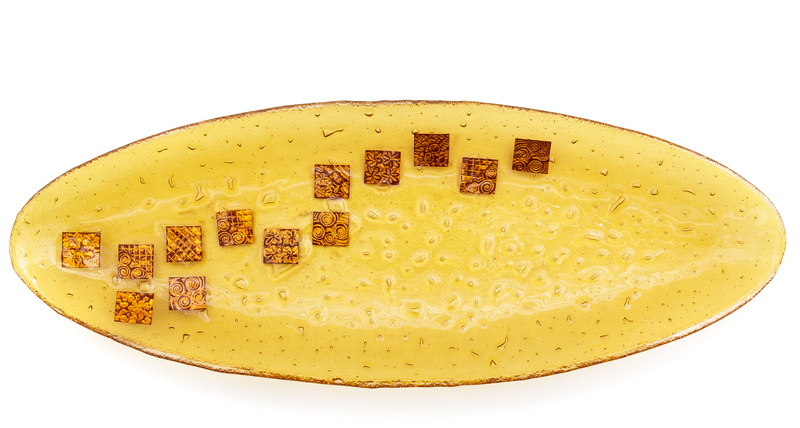 Recalling a precious corolla, the organic shape of the burgundy glass vase, is mottled in its transparency with small bubbles and decorated with engraved sheet copper elements. 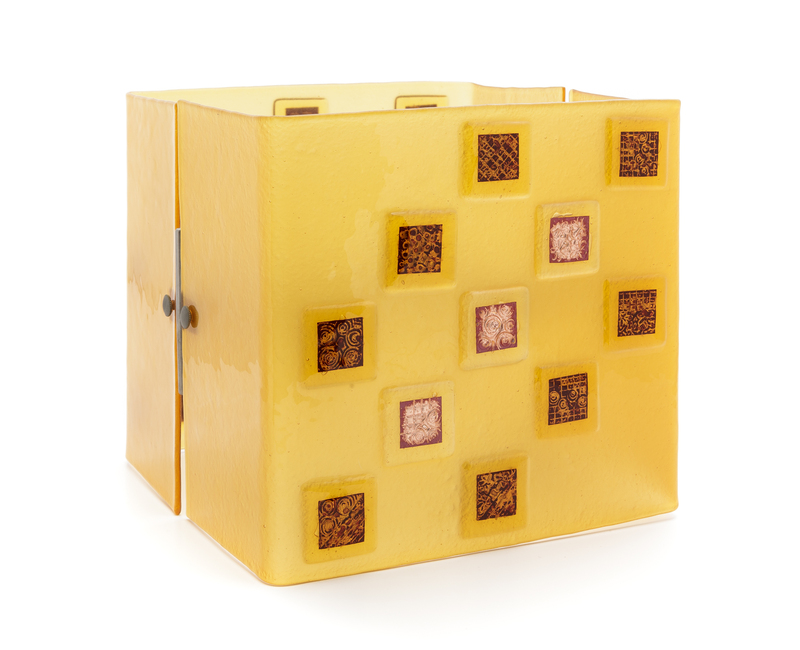 With its minimal and harmonious lines and decorative details, the cube-shaped glass lamp is decorated with different motifs hammered on a copper sheet, which emerge in the precious material effects. 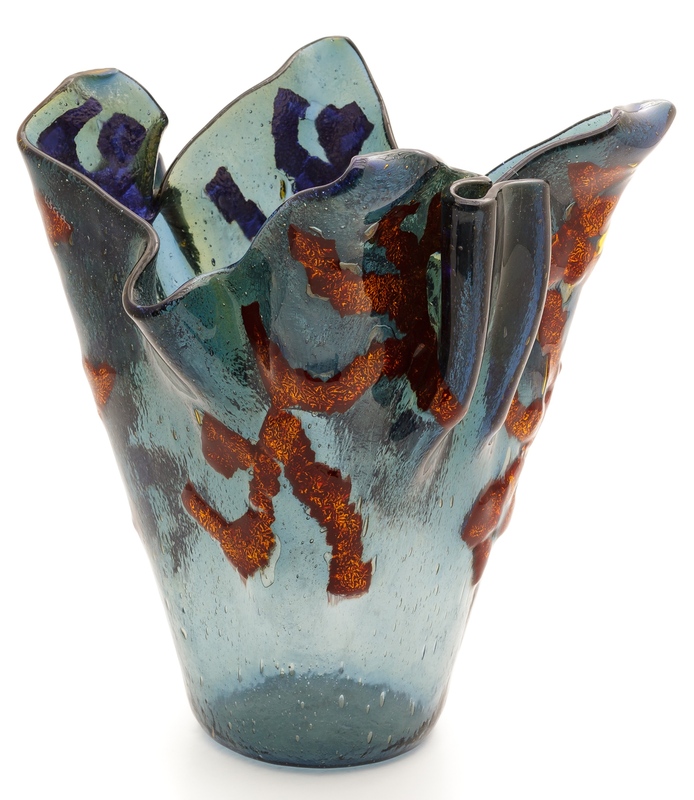 The dynamism of shapes of the glass vase is emphasised by the high quality rendering of the copper decoration, its organic structure, emerging from the irregular blue petrol transparencies. 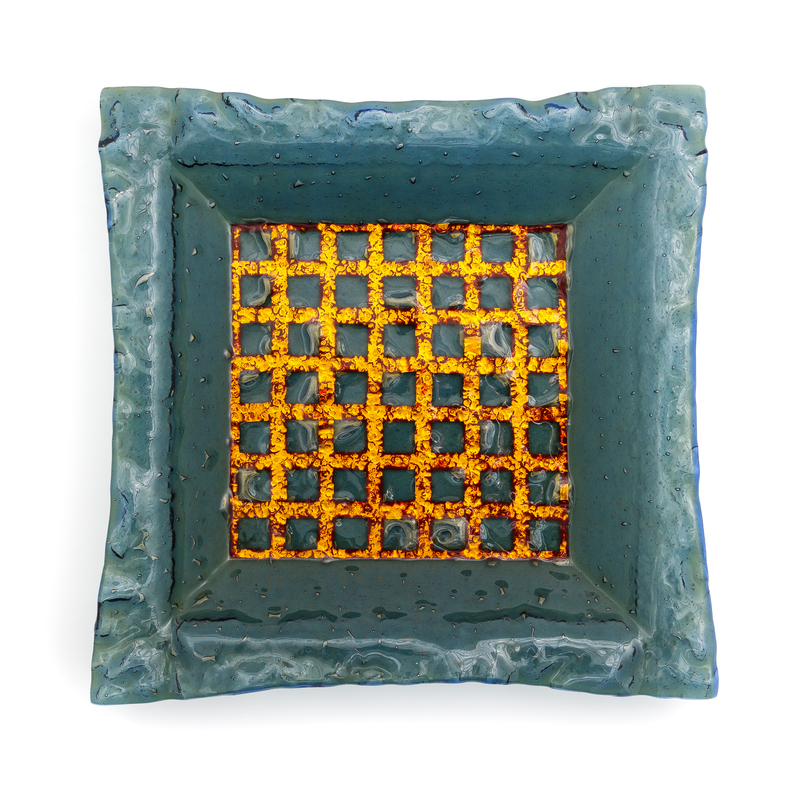 The blue petrol glassy transparency underlines the balanced decoration made of copper plate, skilfully wrought on the large flat platter. 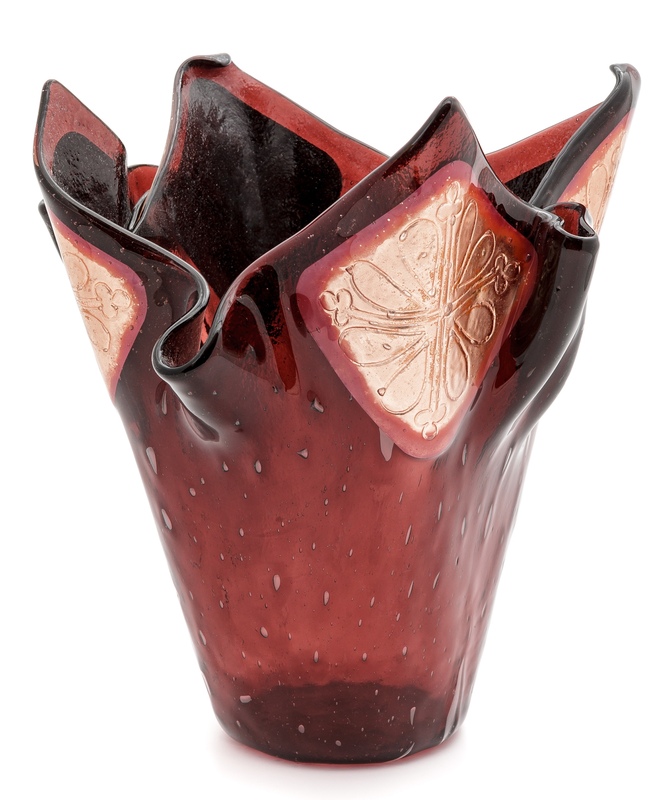 To artist and creative Simonetta Liscia, glass processing is the result of a search for artistic expression that includes the manufacture of ceramics and arrives at the passionate experimentation of the glass fusing technique. Fascinated by the light transparencies of glass materials, she took on her distinctive creative pathway and conducted her studies at the art school of Cagliari, to give life to a unique and recognizable artistic production, characterized by suggestive chromatic effects and melted copper. In this singular contamination of materials, she focused of experimentation, incorporating glass in copper plates that outlined and works textures with cantilever effects, looking for procedures to maintain and enhance the color of the metal in the transparency of the finished product, capturing preciousness in precious materials. Simonetta Liscia's production mainly consists of a variety of pieces of glass lighting and home furnishings: chandeliers, wall lights and table lamps, vases and decorative plates, are characterised by their elegant forms and valuable copper decorations that the artisan realizes with customized procedures, obtaining exclusive items that preserve and transmit the principle of uniqueness. This production is enriched by a limited set of jewelry, precious pieces featuring an equally expressive taste, typical of the workshop. In the workshop, the artist performs fusing, glass melting, plumbing, accompanied by experimental procedures involving the insertion of decorations in the sheets and copper wire worked in advance and intertwined.